Many forex trader simply don’t know this fact that they can trade other instruments and contracts from their metatrader platform that they use to trade forex. You can trade oil, gold,silver, stock indices, and even stocks from most of these metatrader platforms. Just right click on the Market Watch window where the currency pairs are displayed and it will show you the list of other contracts that can be traded from the MT4 Platform. As a trader, you should know this that opportunity keeps on shifting from one market to another. This shift in opportunity gives you the chance for market timining. Market timing means that you spot a trend developing in the market. You position yourself for taking advantage from that trend. You ride the trend to get as much profit as possible and get out before it become late. Now, gold is in an unprecedented bull market. Gold prices are at their historical high. Gold prices are being driven hgh by the abuse and debasement of the fiat currency that has been going on. People are afraid that fiat currency is going to lose value. After all it is just a piece of paper only backed with your own confidence on it’s purchasing power. So, these are the factors that are driving gold prices higher and higher. Some expert are predicting gold prices to double from $1,200 per ounce to around $2,500 per ounce in the next six months. This is a historic opportunity. You should think about trading gold along with forex. When you open demo or real account on Metatrader you will be given account number and 2 passwords. The first password is used to login as a regular user for trading. The second password is called investor password. It is read-only password used to login for observation purposes. You can not close, modify or start any trades, but you can see the real and genuine trading history and even save the trading statement to your computer. Investor passwords are often used by Forex signal services, account managers. When you have investor password you can copy/duplicate the trades to your account. You need to install and open 2 Metatrader accounts on your computer. Account #1 with investor password will act as the server and account #2 will be the client account. Now you need to run a special software called Local Trade Copier on both platforms and all trades from account #1 will be copied to the account #2. LTC software has many features, you can select different lot size on the client side, choose what currency pairs to trade or not to trade. The software is compatible with any broker. LTC software is compatible with VPS. It can be used to copy few Metatrader accounts on 1 VPS or on several VPS. This can be used for account management too. You can run copier on many accounts and trade just 1 account – server/master account. Copier can and will copy the trades opened manually or by another Expert Advisor. Have you ever listened to a renowned professional speaker who has mastered the art of boosting sales like never before? The energy level and the enthusiasm they put in making their presentation a huge success is commendable. These motivational speakers bring freshness to the content by engaging their audience with appropriate content, motivation and direction that will help them to master the expertise over the sales job. They entertain, they make their audience laugh over gags, they make their audience feel uncomfortable by asking them some straight forward questions and most importantly they will challenge their audience with new idea and concept related to practical problems. These extra efforts that they put in make them special and unique. Among the sales tips that they share using theoretical examples, five are discussed in this article which will help novice sales executives to learn and master the trade. Achieving sales target begins with the first step that is lead generation. There are plenty of theoretical tips related to lead generation by using lead magnets and extensive campaigning. But sales experts always suggest practical ways of lead generation and that is reaching out to existing customers and convincing them with solutions that solves their problems sooner. This way they can do a trust building activity and also learn how many customers are interested in trying the new product. 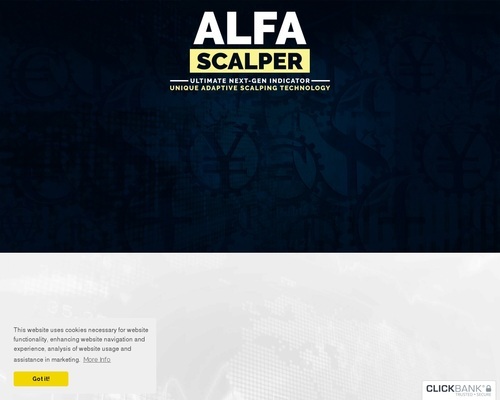 Alfa Scalper is backed with a 60 Day No Questions Asked Money Back Guarantee. If within the first 60 days of receipt you are not satisfied with Wake Up Lean™, you can request a refund by sending an email to the address given inside the product and we will immediately refund your entire purchase price, with no questions asked. A large number of Forex traders depend on the Forex robots, as they are efficient, accurate and profitable. Many are available in the market these days, you can choose according to your budget and requirements. One of such automated currency robots is Forex Megadroid. Forex Megadroid is created by two trading experts with the purpose of making a robot, which can trade in any market condition. Its high winning percentage is the proof of its good prediction ability. It has inbuilt technology called RCPTA or Reverse Correlated Time and Price Analysis, this it the latest technology which enables the robot to analyze the past market data before entering in next trade. It artificial intelligence system enables it to record the experience of all previous trades which it can use for the future trades. It can work 24 hours a day, untiringly. If one is planning to start a side business he can invest his money in Forex market and Forex Megadroid will mange all the trades for him and he can take care of his original business. Megadroid acts like an efficient assistant for the expert traders and can help like an for the new comers in Forex market. Back tested results, 100% hands free trading, has higher liquidity, has a automated stop loss setup for you, calculates the right risk to reward ratio, has a built in profit protection strategy, only trades major currency pairs to guarantee you the smallest spreads. All these features had been proven by professional beta testers. The second reason why the NFP EA works is because the NFP Payout strategy by Kishore M has had a proven track record of winnings over the past few years of manual trading. This strategy has been programmed into an only just recently. The NPF payout takes advantage of the NFP trades that happens every first friday of the month and it is at these times that the market is most volatile to give huge profits when the strategy is applied. The 3rd reason why the NFP Payout EA works is because it comes with a 60 Days Money Back No Questions Asked Guarantee. If it doesn’t work, Kishore would pay your back with no questions asked. The guarantee gives you total confidence that the company is no just selling you something for nothing. Powerup Capital has been around for more than 9 years and if they were cheating, they would be closed down much earlier already. There has been a lot of testimonials about the NFP Payout EA and its about time more people should give it a try.